Wann im Konjunkturzyklus machen Prognostiker systematische Fehler? Eine neue Forschungsarbeit von Nils Jannsen vom IfW in Kiel und mir zeigt dies nun basierend auf einem großen internationalen Paneldatensatz. Das Papier ist nun als Kieler Arbeitspapier erschienen. "Using real-time data, we analyze how the systematic expectation errors of professional forecasters in 19 advanced economies depend on the state of the business cycle. Our results indicate that the general result that forecasters systematically overestimate output growth (across all countries) masks considerable differences across different business-cycle states. 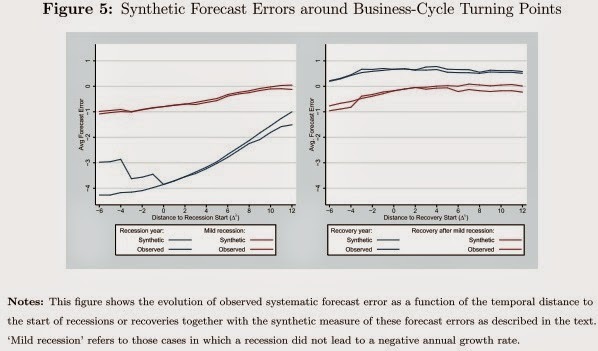 We show that forecasts for recessions are subject to a large negative systematic forecast error (forecasters overestimate growth), while forecasts for recoveries are subject to a positive systematic forecast error. 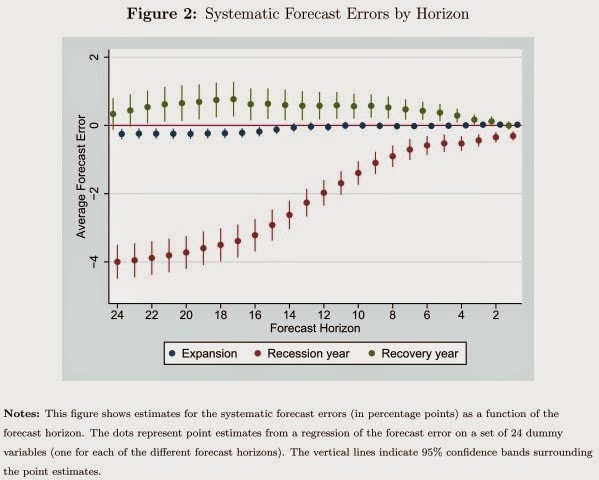 Forecasts made for expansions have, if anything, a small systematic forecast error for large forecast horizons. When we link information about the business-cycle state in the target year with quarterly information about its state in the forecasting period, we find that forecasters realize business-cycle turning points somewhat late. Using cross-country evidence, we demonstrate that the positive relationship between a change in trend growth rates and forecast bias, as suggested in the literature, breaks down when only focusing on forecasts made for expansions." Interessant ist vor allem, dass der Bias von Konjunkturprognosen, den man oft findet, anscheinend allein von Prognosen für Rezessionen getrieben ist, während Prognostiker für Phasen des Aufschwungs unverzerrte Prognosen erstellen können. Außerdem zeigen wir, dass Prognostiker konjunkturelle Wendepunkte erst verzögert wahrnehmen und ihre Prognosen nur graduell anpassen, so dass sich vor allem nach dem Beginn einer Rezession noch sehr lange nach dem Wendepunkt noch ein systematischer Prognosefehler feststellen lässt. Also, mutmaßlich noch viel Spielraum für eine Verbesserung der Prognosequalität (vor allem vor und während Rezessionen).